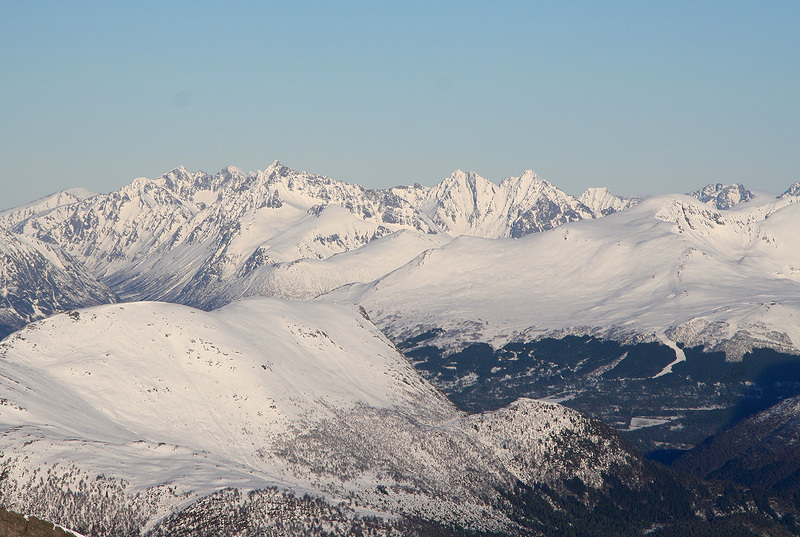 How to get there: A good point of reference is the small village of Volda, this is south of Ålesund. From Volda, drive (south-east) along the fjord (Austefjorden) to its end at Fyrde, then back out (west) along the opposite side. About 7 km from Fyrde, turn sharply left onto a side road that climbs uphill. Just before this road you have driven through the small community Høydalen and crossed the local river on a small bridge. Drive this road uphill in zig-zag turns to the last (and highest) farm. There is parking for 2-3 cars right at the trailhead. If possible, ask permission to park at the local farm (It will be granted, but this is a polite thing to do.) This trailhead is located at N62:04.166, E006:11.838, elevation about 240 meter. Route description: For summer, see the trail on the map. 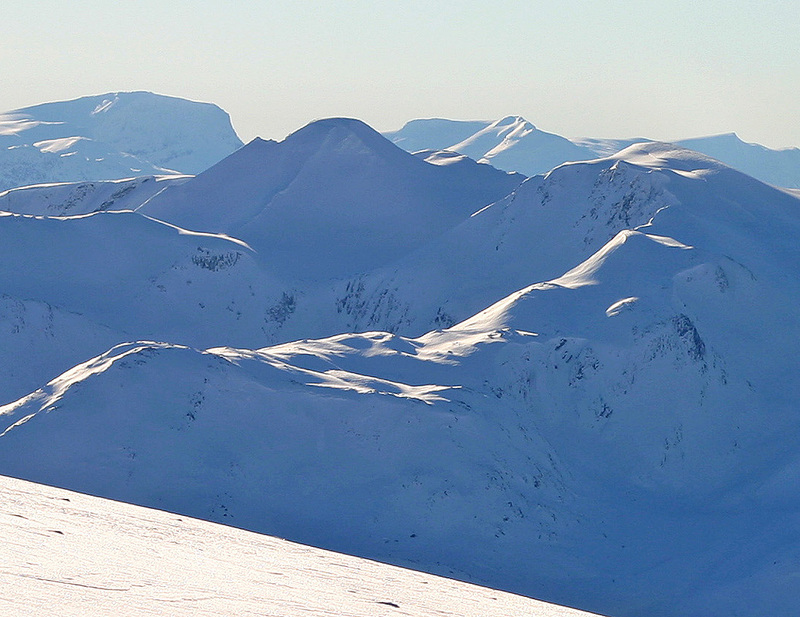 The description below is a winter (ski) route. Head straight uphill from the farm. There is a small trail that can be followed. Cross through the gate in the fence higher up and head a bit more left, along the fence. 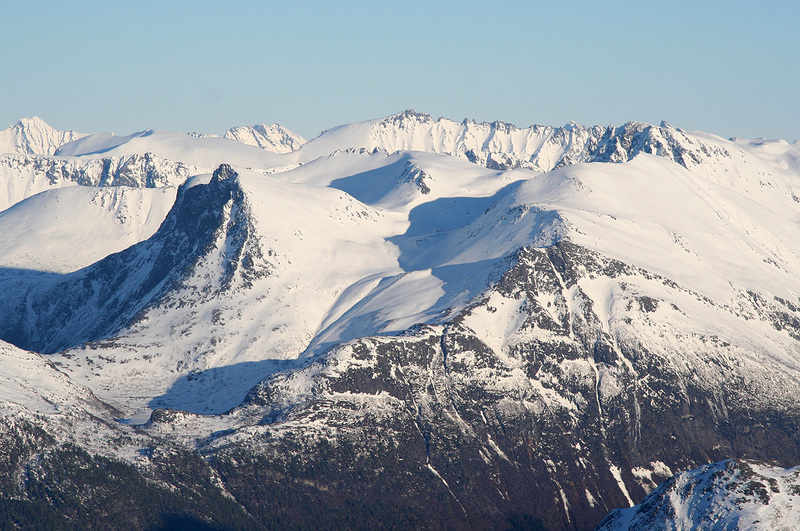 The route now follows the valley as it climbs to lake Grøndalsvatnet at 669 meter. Cross the lake (or go around it if the ice is unsafe) and continue up the slope from the south end of the lake that quite naturally will get you to a somewhat more distinct valley higher up. As you continue up this valley, you will have the subsidiary peak Harpehornet (1192m) on your right, while Eggene 1288 m, will be ahead on your left hand side. Curve left and climb Eggene if this is part of your plan. Alternatively, just ascend the slope and traverse below Eggene in order to reach the interconnecting saddle. 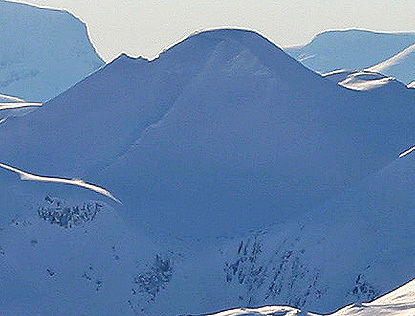 Either way, from the saddle just west of Matøskja, climb to the summit along a slightly steeper slope. 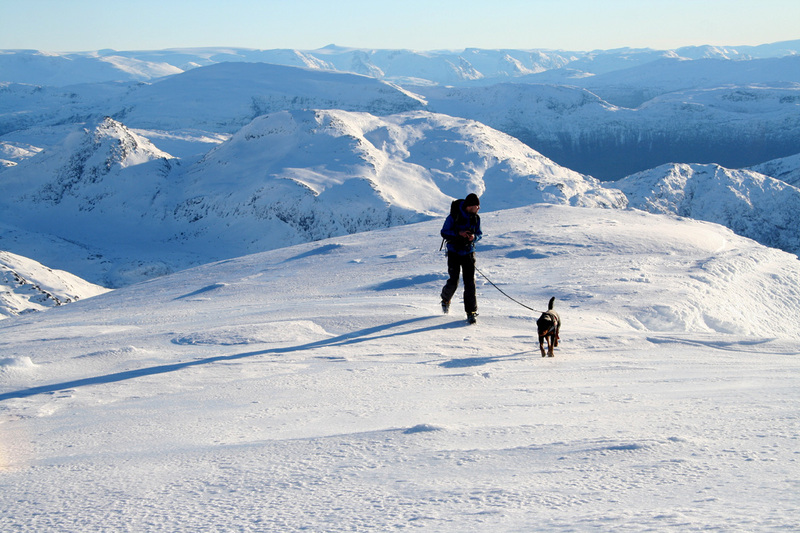 Comments: I did this trip on the last day of January with Arnt Flatmo and two of his friends, Arngeir and Åsmund. I had left Bergen around 2000 on Friday in order to visit Arnt and see his new house located on Gurskøya. SAS managed to loose my skibag (this is not the first time!) and therefore the trip would be on borrowed equipment. Thanks are due to Arnt, Arngeir and Åsmund for all contributing to make this possible. 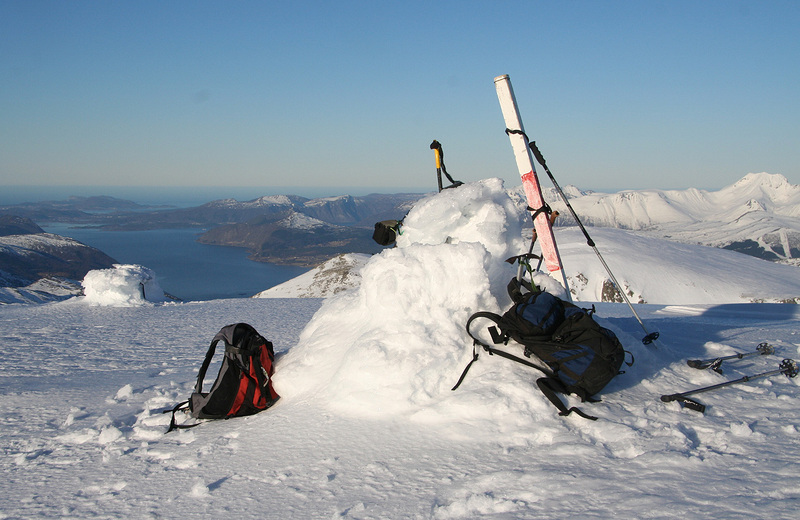 We started from the trailhead at 0955, on foot with the skis on the backpack. Higher up, we started skiing on pretty hard crust. Lake Grøndalsvatnet was almost free of snow. We crossed it and proceeded up the ridge. Higher up, as the terrain leveled off when emerging from the small valley, the snow surface turned very icy and the skins started to slip even on fairly flat terrain. Thus, we left the skis next to a large, prominent rock and continued on foot with crampons. We first ascended the subsidiary peak Eggene, then traversed across to our primary goal Matøskja. The snow was somewhat better up here, but the final slope on Matøskja is steep enough to be awkward for skiing. 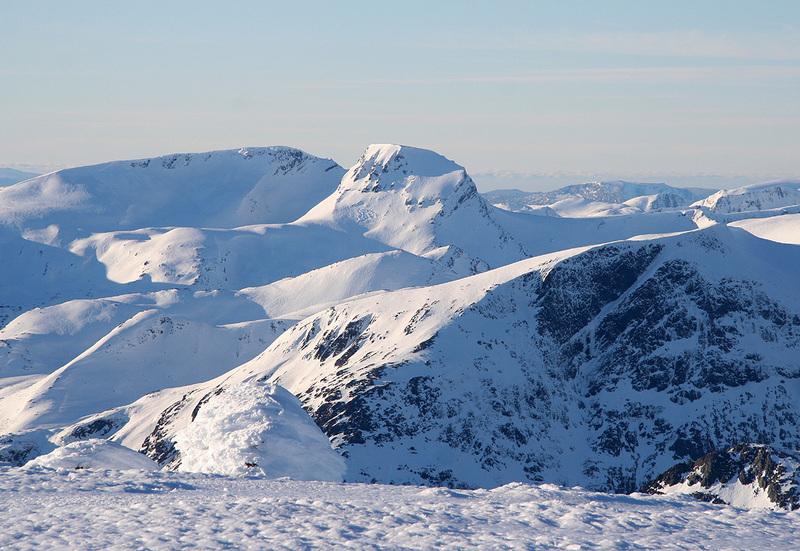 We were at Eggene by 1300 and reached the 1332 meter summit of Matøskja at 1332, well planned indeed. The view was absolutely excellent, the wind had subsided and we all enjoyed looking at the peaks all around. Trollvasstinden, right across brought back memories from our trip there in early January 2003. Opposite, Eidskyrkja, another fine skiing trip from May 2003. Eventually, we started back down. The skiing was icy on borrowed equipment, reaching the car by 1545. Sunnmøre view from the summit. Kolåstinden is left of center. Sunnmøre view from the summit. Skårasalen in the center. View west, the characteristic Felden (1272m) in the center.